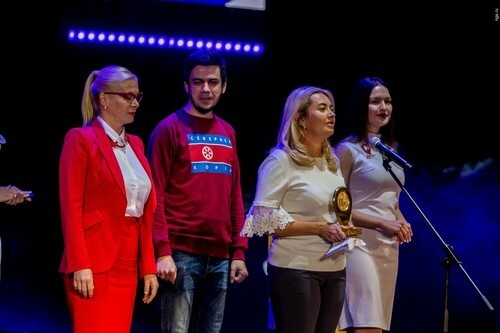 Olga Topchieva, head of events and advertising “Gallery of Novosibirsk”: “Victory in the “people’s prize” — a very important event for us, especially since we surpassed many other shopping and entertainment centres who are older than us. Of course, it is a confirmation of the successful development of the Mall, the effectiveness of our advertising campaigns, the demand for our pool of tenants. It was especially nice to receive this award, under the applause of so many people from the hands of the mayor. I have the feeling that everybody voted for us again and again. We received Federal awards, and, apparently, it did not surprise us, but the “popular prize” will be remembered as one of the most valuable. It is very nice! Thank you to everyone who chose us! And be sure to come to “Gallery Novosibirsk”! You help us become better!”. Alexander Sysoev, the founder of the company “2GIS”: “WITH whom to compare our city NGS? With whom to compare “2GIS”? I am grateful, of course, thanks to NGS, but it was not a competition. Of all such ceremonies in the city, this was the most colourful and representative — the mayor, the Governor, the Opera house. Overall a well organised event, except for the blurry beginning. From my point of view, the appearance on the stage of the national heroes aroused great interest. That’s great. Actually I was most shocked by the project, which was presented by the Governor. He said that he chose the “Investor of the year”, the company “Russian Field” Kargatskogo district, despite the fact that there are investors who invest more money. Further, from my point of view, a miracle happened, when she came Konashkov Vladimir, head of the project. I immediately arose Association with the film “Thomas crown affair”. When there is a tour for schoolchildren in the Museum of the Impressionists and tell them: “Here’s a look at a Monet, it marked the beginning of impressionism”. All bored. Tour guide: “Okay, let’s try something else — a picture is worth 100 thousand bucks.” Oh! Here it was the same: a person says something, all bored, and then he continues about how they Barcelona received the prize as the most modern farm in the world. That is a blow! It was the most beautiful, unexpected. In Kargatskogo district is the most modern farm in the world!”. Alexander Fomintsev, CEO of “Brighter!”: “Amazed that this independent opinion, people can be compared to voting for a ruble or voting with their feet when people come to you. What is unusual is that we began to receive these assessments of businesses. Definitely struck a serious attitude to business, which achieved a high success, focus to breakthrough moments. This PR spin is popularized, it becomes prestigious to be so successful. Perhaps this is new in Russia, because before it was more envy of successful businessmen, and now — the whole gala event at the Opera house with the mayor and the Governor 1200 people, the business elite, Moscow’s leading. Really did not expect. We are a company, you understand, not PR. The owners are humble — that is the corporate culture. It’s the sort of thing: today you are the first on the wave, but the world does not stand still — everything is developing, there is always a more successful business. No one can guarantee tomorrow will be someone stronger than you. But definitely nice. Because we went late to the market. When six years ago it opened the first stores, serious people from the business community twisted at a temple and said, “You will die, you crazy: the whole drank, it is monsters, it is busy, where are you going to get up.” It takes six years — and the people that choose us among the major national chains including”. Lydia Markova,PR-Director of the Center of culture and rest “Victory”: “an Interesting finding was that reward, invited the heroes of publications, and not from the category of “the Mayor opened the next something” or “a”SIBEKO” began the heating season”, and the characters are simple human stories that happen to us every day. This is a touching and important. That’s what struck. Of course, the entire organization of the award, the concert is a figure Nino [Katamadze] , in addition to positive emotions, nothing else can cause. It was nice to see many familiar faces. I think that brought those people that really in this city are active, communicate between themselves. Natalia Sukhareva, co-founder of the group of companies “Medical center“Zdravitsa””: Our life after the victory has not changed, but many employees have received a huge burst of inspiration. Still, it’s one thing when you yourself consider yourself good, and another when it is confirmed by thousands of other people. It’s not just nice, it’s really valuable. Thank you NGS for that organized are actually independent of the competition. As I understand it, the majority of voters are not those whom we reminded of herself, and those who went to the site and made its own independent choice. The next day after the victory, we drove to the reward and cakes for all centres, congratulated and thanked the staff. Now, we are lacking five plates and cups. Of course, we can supply badges in the office, but this victory is not only management. First and foremost this award is designed for those people who work directly with clients. And centers we have five. Helen Karpuk, regional managing network soft restaurants“Own company”: “first and foremost we would like to say a big thank you to our guests for the fact that they took the time and gave us your vote. It is a great honor and pride for us to be a winner in such a prestigious award. It is a huge responsibility, and we promise that we will continue to grow and develop to our guests. After award, we received many positive comments and feedback. Our staff and we are very inspired. We are grateful to the organizers: let this event be the beginning of a long journey, and we are certainly pleased to be the first on the first “people’s award of the NGS””. Marina Bezryadin, General Director of PEGAS Touristik: “the First pleasant surprise for us was that we were in the top 10. And after receiving the statuette winner, we felt responsible for the rest of the customers even more. We felt the trust and intimacy of our clients. Understanding that people trust you, your guests, your family, your emotions, your desire to remember the best moments of life, strengthened our desire to work harder, offer new directions to expand the range. As a result, the company launches a new direction, Jamaica. Huge thanks to NGS for creating this project, we have a desire to participate in competitions and projects with you. All have a pleasant positive emotions and fun trips!”. Toni Toshev, General Manager of the hotel Marriott in Novosibirsk: “We are very grateful and thankful for the confidence extended to us by the city. Did not expect such public support. Now even more attention is paid to details and to improve the quality of services provided. The desire to be the best has become even greater. It’s a big responsibility, and we are ready to take it on themselves. “The people’s award of the NGS” is an excellent initiative that gave the opportunity to citizens, the main consumers to choose their favorites, and a well-organized show”. At the ceremony in Novate gathered 1200 people — the mayor called NGS cocaine.